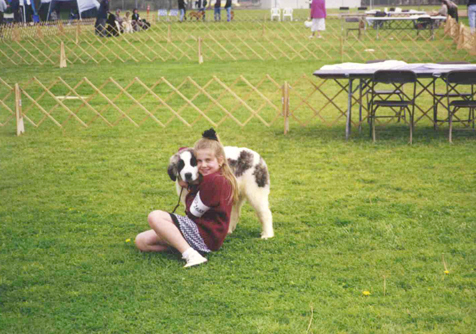 Above: "Zaragoza de la Tierra Alta with Junior handler Dani"
How is the Pyrenean Mastiff registered? The Pyrenean Mastiff is registered here in the United States with the Pyrenean Mastiff Club Of America (PMCA). Offspring born in the USA that are of show and breeding potential will also have FCI documents. What is the origin of the Pyrenean Mastiff? The Pyrenean Mastiff is a very rustic and ancient breed that has been working since the Middle Ages. The history of all pure bred dogs maintains that they are all related to each other. As the flocks moved, and they occupied different territories, the types evolved depending on the environment by the process of evolution. Their diffusion throughout the Mediterranean areas and even to the British Isles is attributed to the Phoenician and Viennese traders. The Pyrenean Mastiff was influenced in the past from the blood of molosser dogs coming to Spain through the south proceeding from Asia in the Phoenician boats. It was distributed within different breeds in the southern part of Europe from Turkey to Portugal and from Caucaso to Sierra Morena. This influence produced two different types of large and powerful dogs. In 1659 Mazarino, Regent of France, negotiated the annexation of extensive territory to the north of the current border from Felipe IV, King of Spain, through the Treaty of Pyrenees. This affected the traditional nomadic wanderings of the canine breeds of the mountain ranges. Starting from this political division there came the development of four different breeds: the Pyrenean Mountain Dog (Great Pyrenees) and the small Pyrenean Shepherd of the French side, the Spanish Mastiff and the Pyrenean Mastiff in Spain. The Pyrenean Mastiff was subject to less European influence than their cousins to the north and with periodic influences of the likes of the Spanish Mastiff and as some say, the missing Burgos Bulldog, which was far less select, coarser and probably less homogenous as they came into contact with the rest of the Iberian breeds with the logical exception of the mongrels. How rare is the Pyrenean Mastiff today? In 1975 a new interest in the breed erupted. Data began to be collected from the elders on their experiences with the Pyrenean Mastiff. There are those who remember the traditional shepherds, some of them landowners, others workers, old veterinarians and small poultry farmers. These are the people who assisted the researchers of the breed since they still had all the knowledge of these dogs. There were dogs that were more homogenous in some areas than in others, and even many half breeds. Eventually about two hundred acceptable specimens were found of which only about half became officially registered. What was the function of the Pyrenean Mastiff? Traditionally these Pyrenean Mastiffs (also known as the Navarra Mastiff, Mastin d'Aragon) belong to the class of dogs of Aragonese fable, who guarded the flocks of sheep in the Aragon kingdom from the many predators who preyed on them in their nomadic movements, and who reached their peak in the fifth century. Due to the characteristics of the countryside in the old Kingdom of Aragon the seasonal journeys were much longer and the work of the dogs much harder than that of other breeds. This together with the climate and the mountainous regions where they had the task of guardian, developed the characteristics of the breed. How large can the Pyrenean Mastiff get? There are no limits to the maximum height and those animals that are taller whenever proportioned will be preferred. Ideal height at the withers for males is 32 ins/81 cms and 29 1/2 ins/75 cms for females. Minimum height will be 77 cms for males and 72 cms for females. Genetics play a big part in the height and weight range of the Pyrenean Mastiff. There are healthy males that have attained a full two hundred pounds and a noted female that actually weighed in at 187 lbs! The average female may however only weigh around 130 pounds plus. What are the coat colors of the Pyrenean Mastiff? 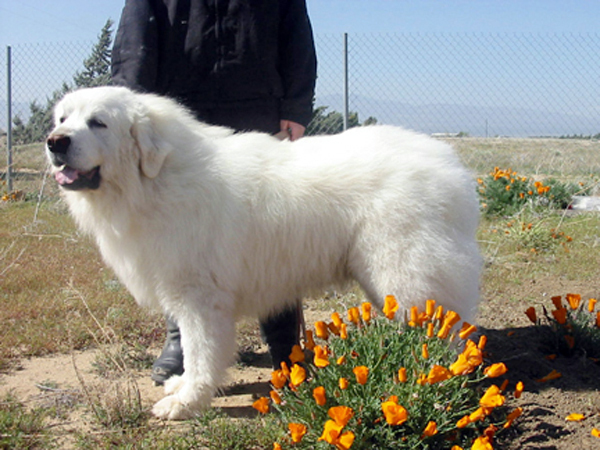 There are nine accepted coat colors for the Pyrenean Mastiff. The base coat is always pure white or snow white with patches of color that are retained on no more than fifty percent of the body. These include medium gray, deep gold - sand, dusk, black, silver gray, light tan, sand, brindle, red. Base coats that are yellowish white for the whole are not desired and absolutely white animals are considered a fault. Another fault is absence of a well defined mask. Why do Pyrenean Mastiffs differ greatly from one another? Pyrenean Mastiff offspring do not always exactly resemble their parents. You are as likely to find a puppy with a perfect mask in the same litter as one or two showing only a half mask or even no mask at all. There are many other diversities not only in color but with size, structure and temperament. Do they get along well with children? The Pyrenean Mastiff is an excellent companion to children. It is loyal and loving and at the same time protective. Despite its large size it is extremely gentle especially to those which it protects and only becomes very angry if severely challenged or provoked. In the case of very small children it is recommended that they be supervised since these large mastiffs are known for "giving the paw" and can unintentionally overwhelm one of lesser size or weight during play. Do they get along well with other animals? The Pyrenean Mastiff will get along well with all animals that it is raised with since it comes to view them as "flock" and will perform the function it knows best as guardian and companion. Are they people or dog aggressive with newcomers? The Pyrenean Mastiff is not a "people aggressive" dog or "attack dog". It protects that which it is close to from danger should the need arise. This can be the case should a person directly challenge the mastiff or that which the mastiff holds dear in a threatening manner. The Pyrenean Mastiff is wary of strangers and will often not become trusting or accepting of newcomers until "introduced". The Pyrenean Mastiff will fiercely defend its territory from predators including other dogs. This is not to say that it will not get along with another breed but as with many breeds it will not tolerate a challenge from another male of the same age and the same for females - since there is usually an alpha female. Are they cat tolerant? The Pyrenean Mastiff will consider the cat as part of the flock it is to guard and thus doing so will inevitably get along well with cats. Strange or wandering cats may be a source for further investigation by the Pyrenean Mastiff as it will not allow any unwelcome intruders. Are they intelligent? The Pyrenean Mastiff is an extremely intelligent, alert and loyal dog. They posses the instinct for guarding and protection without requiring human intervention - such as in the case of the herding dog which relies on commands and signals from it's owner in order to perform it's duties. The Pyrenean Mastiff is agile and despite its large size, is surprisingly quick and sure footed. Basic obedience training is recommended and the Pyrenean Mastiff is eager to please its owner, therefore making the job of training a little easier for both. This should begin before the dog becomes too "set in his ways" and also due to the size of the Pyrenean Mastiff is important for safety reasons. In training the owner must remember that the Pyrenean Mastiff does not reach mental maturity until the age of two so be prepared for "puppy behavior" for a while and patience is always a virtue. How much exercise does the Pyrenean Mastiff require? Are they an active breed? The Pyrenean Mastiff does not require excessive exercise and are happy to accompany their owner on walks and trips. Rigorous exercise is also not recommended for young pups who will be happy to play among themselves or with another of compatible size. However they are a dog who will remain relaxed unless extra energy is required for play or sudden investigation of the unusual. At this point the speed at which the Pyrenean Mastiff will spring into action is very impressive. What kinds of health problems can affect the Pyrenean Mastiff? As a rule the Pyrenean Mastiff is a very healthy breed due to the fact that there have been few changes in its genetic type. Health problems that may affect the Pyrenean Mastiff include entropion, ectropion, abnormalities of the jaw, gastric torsion, inflammatory bowel disease and occasionally hip dysplasia. Fortunately the incidence of hip dysplasia in the Pyrenean Mastiff breed is still relatively low and with selective breeding should stay this way. What is the longevity of the Pyrenean Mastiff? The Pyrenean Mastiff is a fairly long lived breed with regard to the giant breeds and it is possible for many to reach the age of twelve. We have had those that have reached 13 1/2+. What are the grooming requirements for the Pyrenean Mastiff? Do they shed? The Pyrenean Mastiff is a "double coated breed". The coat is pretty much self cleaning and continual shedding is really not a problem. It is not a high maintenance breed with regard to grooming but does require some in order to keep mats and tangles from forming especially around the ears and the more frequently this is done, the better. This will also be necessary when the mastiff "blows the coat" usually before the weather gets too hot. It is important to remove the loose hair using a good undercoat rake or slicker brush. After whelping a female will also lose coat and more grooming will again be necessary. Never shave a Pyrenean Mastiff - the coat protects it from heat stroke. What type of a climate is suited to the Pyrenean Mastiff? The Pyrenean Mastiff has adapted well to most climates and this was necessary for the breed since it traveled great distances with the flocks and was exposed to many climatic changes. They are of course very much at home and are active in the cold weather. Warmer climates will usually result in the mastiff retiring to a cooler den to sleep off the hottest hours of the day. Shade and plenty of water should be available at all times. A very humid zone may prove to be uncomfortable for the Pyrenean Mastiff. Just imagine yourself wearing a fur coat in this climate and not being able to remove it!! Basic common sense needs to take care of your dog in this climate is important. Does the Pyrenean Mastiff drool? The Pyrenean Mastiff will often drool in hot weather and if it is excited or around a special food or treat. It is not uncommon to be greeted at the gate by a slobbering giant with strands of drool hanging from either side if the mouth! Does the Pyrenean Mastiff like water? Many love it especially when the weather is hot. If introduced to it at an early age there are those Pyrenean Mastiffs who will not think twice about joining the fun in the family swimming pool! Do they have a large appetite? The Pyrenean Mastiff is definitely a "good eater". After the Spanish Civil War food was in small supply and it was at this time many found that keeping such a large dog that ate so much was just not practical especially since the wolves and bears were no longer a threat. Hence resulting in the reduction of the Pyrenean Mastiff as a breed. A premium food is important to puppies for correct growth and to adults for maintenance. Also breeding females will increase their food intake during this time. Are Pyrenean Mastiffs excessive barkers? The Pyrenean Mastiff as a rule is not a useless barker. The mastiff does however have a resounding bark and will alert the owner to a possible problem or intruder whether it be night or day! Is the Pyrenean Mastiff a good house companion? The Pyrenean Mastiff can make a good house companion but of course there are aspects that should be considered beforehand. These dogs are large, can drool, can be messy or destructive if left to their own devices for long periods of time and/or are in the puppy stage. What size of yard and fence are necessary? The Pyrenean Mastiff is definitely not a dog suited for very small areas or apartment living. This breed requires an adequately sized yard with a strong fence or wall that is tall enough to prevent climbing and impossible to dig under (6 foot high chain link can be easily climbed by a Pyrenean Mastiff looking for a way out). Remember, boredom is often the driving force that will force a dog to look for a way out and he usually has more hours in the day to spend doing this than you have to watch him! Keep your Pyrenean Mastiff happy with his own toys, food, water and plenty of companionship from you and if possible another family companion. Are Pyrenean Mastiffs prone to digging and chewing? The Pyrenean Mastiff is usually content in its home surroundings if it is provided with a loving home and owner - however bad habits can be formed during puppyhood beginning with chewing the odd shoe and if undisciplined this can result in greater destruction as an adult. However each dog (not unlike children) has a different personality so while some may be well behaved there will be those that will require more frequent discipline. Is the Pyrenean Mastiff the right breed for me? The Pyrenean Mastiff will do well with one who is more of a friend than an owner.... companionship, necessary care, adequate shelter, medical attention when necessary, discipline when necessary and most importantly love - these would be the basic requirements for a future Pyrenean Mastiff owner. The PM’s are not so aloof as the Great Pyrenees with regard to temperament. The PM’s are fast learners and respond well with consistent training. In general the PM's are not a "useless barker". They will however alert if there is cause to do so. Where as the Great Pyrenees is often hailed as a notorious barker. The PM’s have a much heavier bone structure and much larger head with pendulous ears - they are in general a larger and taller breed than the Great Pyrenees. The PM’s have a wealth of loose skin on the body and under the throat to protect them in the fight with the wolf. The PM’s coat lays flatter to the body where as the Great Pyrenees coat stands out from the body. The PM’s have webbed feet and splayed toes unlike the compact Great Pyrenees foot. The PM’s usually will eat twice as much especially in winter and as a rule have usually a larger appetite. The PM’s usually have greater longevity – 12 to 14 years and some even longer and have less health issues due to selective breeding efforts. The PM’s should carry a full mask that does not fade and well defined body patches of color. Pure white specimens can sometimes arrive within a litter of pups – but are not suitable for exhibition. The PM’s have either double or single dew claws – formerly were removed but now no longer is this the case – where as in the Great Pyrenees it is mandatory and they must have double dew claws to enter a show ring. The PM’s have a longer and narrower muzzle and deeper dewlap. The PM’s may show some haw when relaxed. The PM’s have a broader chest – much more powerful and are heavier than the Great Pyrenees.